How to Help and Contact Info. 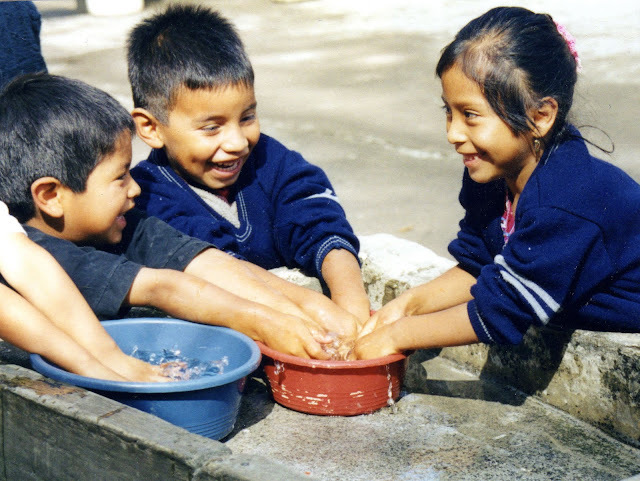 From the beginning efforts were made to help in Patzicia, but it was so far from the Alta Verapaz area where the Andersen's lived, that it was decided to accept youth from there to go through the Vocational Education program at Valparaiso. Daniel Choc was one of them who became a key person in that story as mentioned elsewhere on the website. His sister, Carmela, a cousin, Jose Choc, and Gonzalo Cujcuj and sister, Carmela all became students at the Valparaiso CID. Later Daniel's brother, Serapio, also became a student at the CID. Later a Foundation donor and trustee supported Guatemalan, Mario Salazar, as a missionary who spent his mission in Patzicia and started a small school in the chapel with Foundation support. 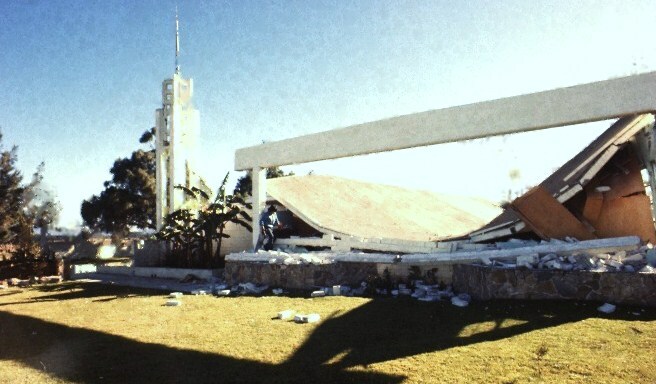 When he finished his mission the Foundation supported his brother, Julio, to keep the school going, but there was some kind of problem and he couldn't use the chapel anymore and began using a rented building. For several reasons Cordell finally felt it best to discontinue the effort. Then in 1976 Cordell had the impression that he was supposed to again do something there. He visited during a weekly activity at the chapel that was poorly attended. He talked to the leaders and his offer to help was accepted and he began making the 10 hour round trip once a week giving Good Life lessons each Tuesday night. The visits were made with a packed Cultural Hall and anticipation was high for the next visit. Note: Cordell while there put his foam pad down and slept on the stage you see in the above picture. The next visit was scheduled for February 1, 1976 but visitors showed up at Valparaiso--the Penrods, and Dr. Buz Sandberg from SLC. Cordell sent a telegram advising them he wouldn't be there until Thursday. That night, or early the next morning at 3:00 a.m. February 2nd the earthquake hit The building collapsed and an Elder Ellsworth was pinned on that stage by a cement beam and was there for hours until rescued. 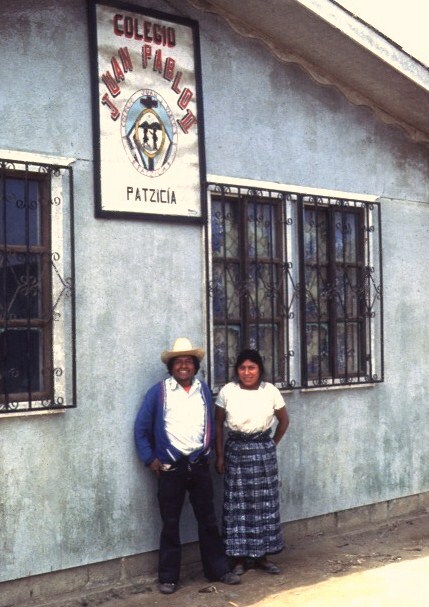 Patzicia is a 90% Indian town 7,000 feet high in Guatemala's Central Highlands. It was devastated by the earthquake that killed 23,000 Guatemalans, thousands of them in Patzicia. It had been near total destruction destroying all the churches, and schools. 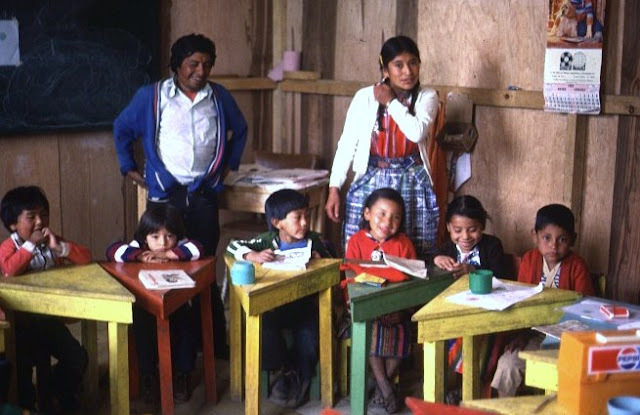 The government was overwhelmed and unable to do anything with the schools, but one group of parents wanted education for their children and got together to start their own school. A Catholic priest’s help was acquired, and he was soon able to get financial support from World Vision, a Protestant aid organization. They required that a weekly Bible class be given at the school by a Protestant minister. The parents begrudgingly accepted, countering in a way by giving the school the Pope’s name. At the same time Cordell was spending every other week in the area with projects in the Saquiya Village of Patzun, helping to organize a cooperative in Comalapa, and with several needy families in Patzicia. After a year or so he went back to working full-time in Alta Verapaz until the Guerrilla War made necessary some shifts in 1981, as explained in the History segments. 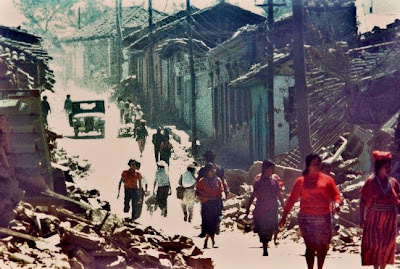 So, headquartered in Guatemala City, he began an aid project in Patzicia for the Foundation to follow up on agricultural projects he had cooperated with in the time of Dan Noorlander who was called an "Agriculture Missionary." During that time the Foundation and Cordell donated some Jersey heifers, and other farm animals, plus a garden cultivator and hammer mill. He had also become the Field Director for AYUDA Inc. and was managing several of their projects in Patzicia. NOTE: To get that whole story, go to: CUNEN and AYUDA, Inc. In those projects there arose some problems and frankly he became a little discouraged. Then a better option appeared. 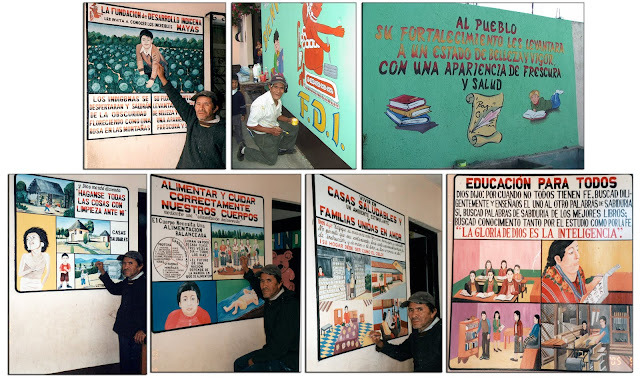 A friend, Domingo Soloman, participant in the cooperative project and Good Life classes, invited him to visit the school born of the earthquake. It was housed in a very inadequate rented building you see in the photo below. It was struggling. The priest was long gone, and World Vision was beginning to withdraw its support and was threatening total withdrawal. Cordell was fascinated with an Indian initiated school bearing Pope Paul II’s name, supported by a Protestant organization, managed by an LDS President of the Parent’s Committee (Domingo, you see above), and directed by a young LDS teacher, Florinda, you see below. He and the Foundation adopted the project and soon were in total charge. 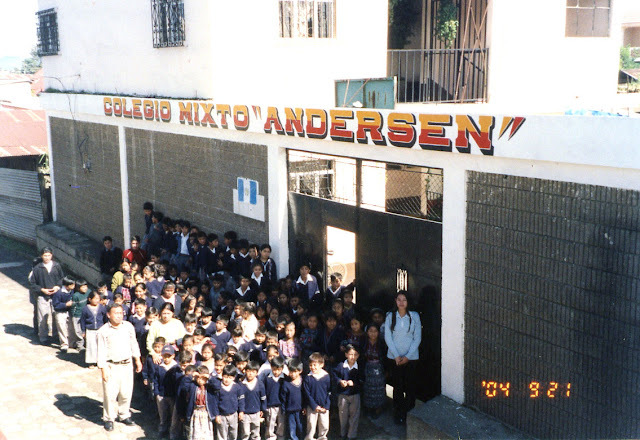 Soon Humberto Xicay, one of the teachers, became the Director, and by 1984 a new school had been built by the Foundation and parents (which is another incredible story), and at the dedication the parents, students and teachers unveiled a new name, calling it THE ANDERSEN SCHOOL (known usually over the years as THE CID #2 SCHOOL). By this time the motivational corner stone for the school was the Foundation’s “Philosophy & Principles of the Good Life,” with exhibits depicting them all around the exterior corridor. Below you see one of them, faded by the sun over about 15 years. Eventually an Indian artist was found among the student's parents who was put to work painting new Good Life exhibits at the school we'll show in a moment, but first lets get a few glimpses of the students at this special school. At about the same time, Professor Humberto Xicay , also became the Regional Director for the FID. His teaching staff at the school was, and still is, of mixed ethnicity—Indians and Ladinos (Europeanized Guatemalans), and Protestant, Catholic and Mormon. Cordell and Humberto are seen below with the staff in the school office. Contrary to what has been traditional in Patzicia with even bloody conflict between Indians and Ladinos, the staff and mixed student body goes forward in harmony preparing for a better life as brothers and sisters. It is unique in the area and many feel it is the most prominent and successful school in the area. About one third of the students, by Guatemalan standards, are well off compared to the rest. Another third are borderline and need the reduced costs at the school made possible by Foundation aid, and the last third are in extreme need, many in single mother families, others are orphans living with an aunt, or grandmother, etc. all of whom would be unable to get a quality education if not for the Foundation. 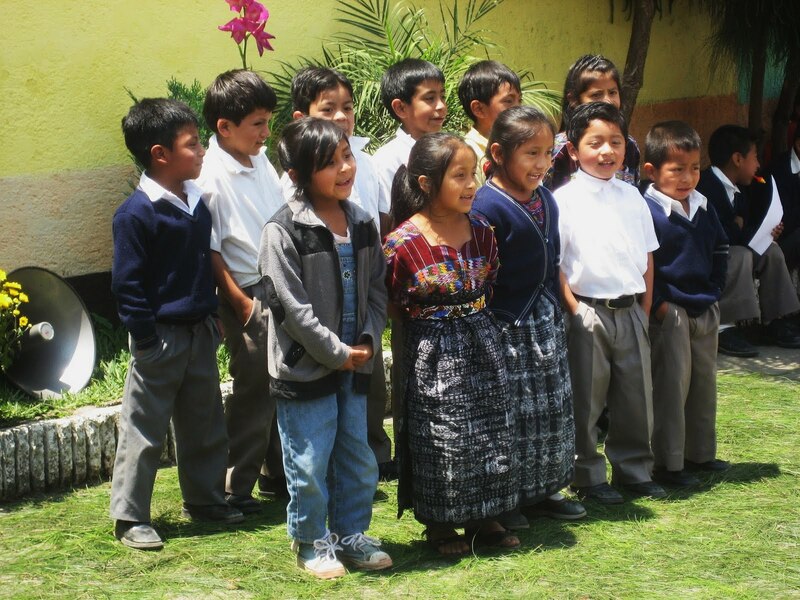 The Foundation gives what is called “a scholarship” to those in need, exempting them from paying tuition, the monthly fee, and they are provided educational materials, the simple school uniform and often a needed pair of shoes. Both Indians and Ladinos are happy together as you see in the above photograph, and are taught to appreciate their cultures and their shared history. Cultural events are frequent in which the children participate in typical song & dance. 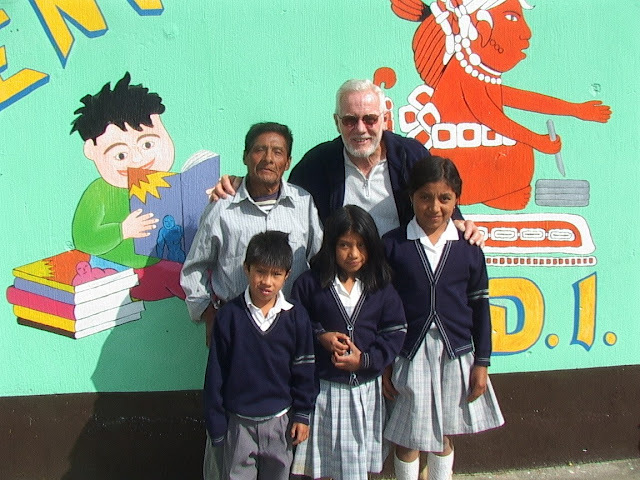 Our friend, Domingo Soloman, who introduced the Foundation to the school in 1982 is seen here visiting the school and posing with three of his grandchildren who are students at the school. Below can be seen a glimpse of the murals and exhibits of the Philosophy & Principles of the Good Life that decorate the walls and corridors of the school. The painting was done by an Indian artist who also has grandchildren at the school. 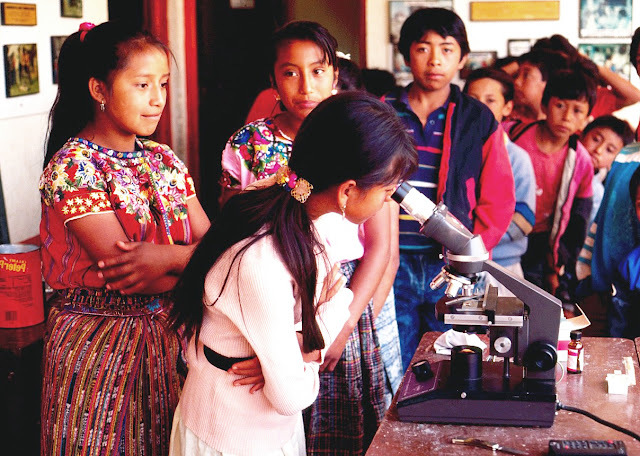 It’s worth repeating that “education” is crucial as many of those in Guatemala with little education haven’t understood sufficiently how important nutrition is as the basis of many diets is white corn tortillas—white corn being a food nutritionists state is, “Incapable of sustaining and supporting human life.” So, as explained in that Nutrition section, the FID sponsors nutrition experiments to show our students & parents the importance of a balanced diet. This started in Alta Verapaz, but has continued in the Patzicia area. With Foundation help emergency aid is provided the students and their families and, with the help of several other medical organizations, the school is turned into a medical clinic several times each year treating all needy who are interested. In addition the school is the major entity in the area that supports and participates in the annual area Fair parade, and in other civic activities, such as the Independence Day parade. The most recent new development at the Patzicia School is the addition of The Dr. C. Jess Groesbeck Computer Lab, considered one of the best in the Cakchiquel area of the Central Highlands, as seen below. Concerning the financial support of the school it is good to know that the students, parents, teaching staff, graduates and friends participate and help all they can. 23-25% of the expenditures are covered by them, the Foundation taking care of the remainder, mostly the paying of wages for the staff. 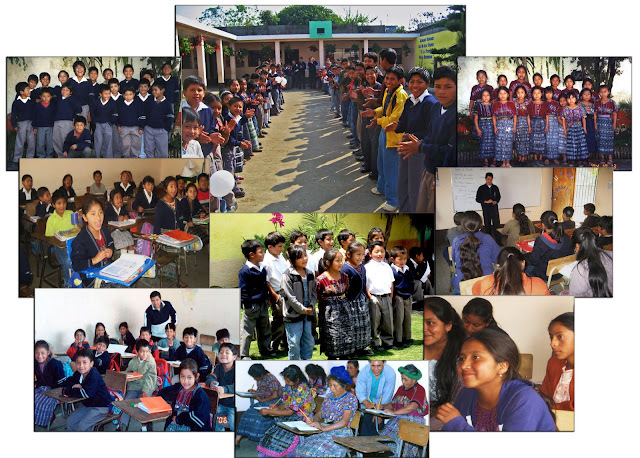 Recently the staff at the Patzicia School did their best to compile crucial statistics of the school's 36 year history. It was very difficult as we have no data from the first 6 years, just some rough estimates. Our best estimate is that through 2011 there have been 1,395 graduates. We are more regarded with all those prospects and details which are indeed considered to be more essential and favorably for the future would even proved to be much better. Vocational Education: "Learning With a Shovel"
TEACHING NUTRITION: Proving "We are what we eat"